1) Split wings into drumsticks and wing pieces. Then place wings in large zip lock bags and pour in hot sauce. Marinate overnight. Combine honey and bbq sauce and whisk to combine. 2) Preheat grill. Then cook wings over indirect heat for 40 minutes, turning every 10 minutes. It is very important to make sure you are using indirect heat. 3) Then remove wings from grill and place in large bowl. 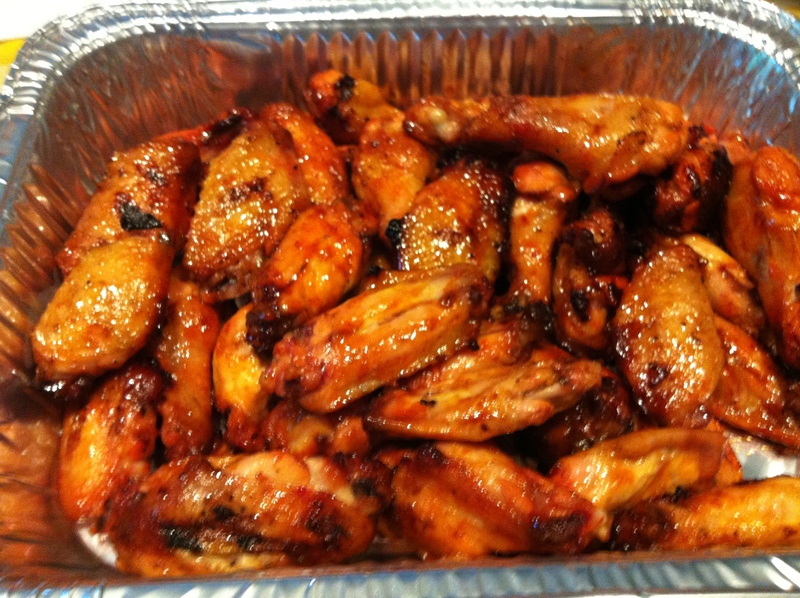 Pour honey bbq sauce mixture over wings and toss to coat. 4) Place wings back on grill on indirect heat and cook for another 15-20 minutes until wings have a nice glaze on them. Remove and serve. I just made these. They were delicious. When I separated the pieces, I saved the wing tips in the freezer because I’m planning to make a chicken broth and they would help make the stock. I thought it was better than throwing them away. I marinated the wings for a full 24 hours in tupperware containers, shaking them around occasionally to ensure everything was coated. I cooked the wings on a charcoal grill with the heat starting at 350F and lowering to 300 by the end. For the BBQ glaze, I used Wegman’s brand Memphis style mixed with honey and it tasted really good.